3) It adapts that tradition through experience into something combining old and new ideas. 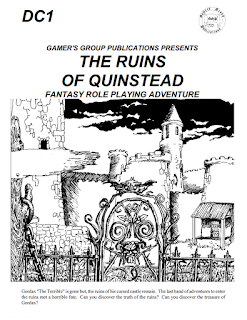 4) It is produced and published independently of AD&D’s existing owner. How’s that for an “Old School Renaissance”? Are there earlier third party modules with a consciously declared back-to-the-roots message? Here is a puzzle for the Acaeum sleuths! Huh. Interesting. Thanks for the review! First level is harder to pull wonder out of with experienced players. Familiarity is high, and customization ranges narrow. The sweet spot of D&D parallels a DM's increasing range and the top out comes at each group's complexity ceiling. So it's interesting that the lower levels have a verve that the first lacks. That's a good observation. Thinking about it, traditional OD&D-style megadungeons seem more flexible when it comes to challenge variety than "story mode" D&D. b) they are more open to the irrational, and just making it up. a) is important but b) may be even more significant. In a lot of later AD&D modules, even fairly good ones, the authors don't dare to stray outside the rules=physics boundary. On lower levels, the system provides little to work with, but the limit is really in our mind. It'd be interesting to see how much extra content there is in there. The d20 version may have a different layout. The version I read is a very dense text with few illustrations. Why are you reading let alone reviewing anything less than your 5/5? Why review anything you don't think is excellent? Don't you have a liver to watch out for? I purchased one of the original blue covered modules many years ago and have ran the module dozens of times for multiple groups. While it may not live up to today's standards (nothing too challenging for today's gamers), my groups have always loved the hack and slash simplicity the module has to offer.